What's changing, what's not, and what's new? We know, we know, it's only just been the new calendar year and already we're talking about the new tax year! At Pay Check we find it's better to get ahead of the game and be ready for what to expect in the April payroll. Below you will find a comprehensive round up of the changes ahead, summarised in a handy guide. If you are a current client, check out the Year End Timetable for a detailed view of your responsibilities over the next few months. The annual personal allowance increases from £11,850 to £12,500. This gives a monthly tax-free amount of £1,041.67. The earnings over the upper earnings limit changes, up to £50,000.00 at 2%. You can only make National Insurance deductions on earnings above the Lower Earnings Limit (LEL). We ask clients to inform Pay Check of any salary changes as for audit purposes we do not automatically change pay rates on the 1St April 2019. If you would like a report detailing employees pay rates and age, please contact your account manager to have this sent through in the March payroll. The first six weeks of maternity pay remains at 90% of an employee’s average weekly earnings. The rate for the next 33 weeks increases to £148.68 a week. If an employee’s average weekly earnings are lower than the statutory amount they will receive the lower amount for 39 weeks. There is no change to the amount of SMP/SPP that can be reclaimed. This remains at 92% unless you qualify for Small Employers Relief. Small Employers Relief remains unchanged at 103%. The threshold for Small Employer relief remains unchanged at £45,000 - this means you must have paid less than this amount in NICs in the previous tax year to qualify for Small Employers Relief. Paternity and Adoption pay increases to £148.68 per week or 90% of average weekly earnings if less. Shared Parental Pay increases to £148.68 per week or 90% of the employee’s average weekly earnings if this is lower. Parents will be able to share up to 50 weeks leave of which 37 weeks are paid at £148.68. The threshold to qualify for SMP, SPP, SAP and ShPP has increased to £118. SSP has increased to £94.25 per week. The threshold to qualify for SSP has increased to £118. The weekly statutory amount is still £508 per week. The Employment Allowance remains at £3,000 for employers. There are no changes to the eligibility criteria to claim the allowance. From 2020/21, the Employment Allowance will only be available to employers with a National Insurance bill in the previous tax year of £100,000 or less. The Apprenticeship Levy allowance remains at £15,000. There are no changes to the eligibility criteria for the calculation of the levy. There will be further changes coming in to place from April 2020 which will see the cost of making a termination payment increase significantly. This was originally scheduled for April 2019 but HMRC delayed this roll out in an update to their original legislation. The new measures will be brought in to place in an attempt to align the rules for tax and secondary NICs, by making an employer liable to pay NICs on termination payments they make to their employees. From April 2020 employers will need to pay employers Class 1A NICs on any part of a termination payment that exceeds the £30,000 threshold. It is anticipated that this will be collected in real time as part of weekly/monthly payroll submissions to HM Revenue and Customs (HMRC) and not after the tax year end with other Class 1A returns. Up until April 2018 the rules stated that where the employer has a right or discretion under the employment contract to terminate the employment by making a PILON rather than allowing the employee to work out his notice period, the PILON is earnings and is not eligible for the £30,000 exemption. Where there was no PILON clause in the contract (or a discretion was not used), the PILON was compensation for damages for the employer’s breach of contract in not allowing the employee to work out their notice and was eligible for the £30,000 exemption. From April 2018, all PILONs are both taxable and subject to Class 1 NICs. The legislation requires the employer to identify the amount of basic pay that the employee would have received if they had worked their notice period, even if the employee leaves the employment part way through their notice period. The amount is treated as earnings and is not subject to the £30,000 income tax exemption. All other non-contractual payments are included within the scope of the £30,000 termination payments exemption. The threshold before deductions for Plan 1 student loans increases from £18,330 to £18,935 per year (£1,577.91 per month). The repayment rate remains at 9%. The threshold for deductions for Plan 2 student loans increases from £25,000 to £25,725.00 (£2,143.75 per month). The repayment rate remains unchanged at 9%. There is a new Postgraduate Loan Deduction, which is payable at 6% after reaching the threshold of £21,000 pa (£1,750.00 per month). 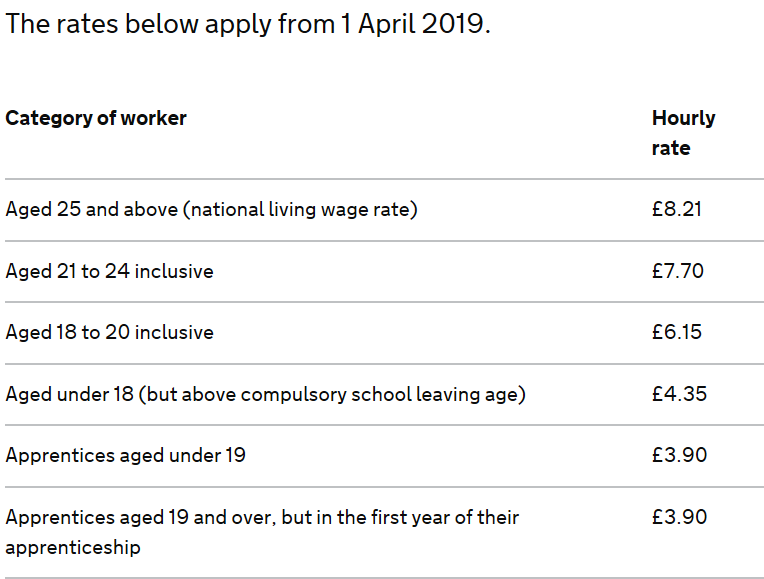 From 6 April 2019 you’ll pay new Welsh Income Tax rates if you live in Wales. Those rates will be set by the Welsh Government. This means the amount of tax you pay on your wages, pension and most other taxable income may change. You’ll continue to pay the same tax as the rest of the UK on dividends and savings interest. Your Personal Allowance - the amount of income you do not pay tax on - also stays the same as the rest of the UK. What does this mean in practical terms? For 1920 the Welsh government have not diverted from the UK wide tax rates but in the future they could change up to 10 pence on the pound. If your employee resides in Wales they will receive a "C" prefix tax code. The Employment Rights Act 1996 (Itemised Pay Statement) (Amendment) Order 2018 and Employment Rights Act 1996 (Itemised Pay Statement) (Amendment) (No 2) Order 2018 come into effect from 6 April 2019. These regulations extend the right to receive a payslip to all ‘workers’ (i.e. not solely employees) and, where employees or workers are paid for variable hours, require the number of hours worked to be recorded on the payslip. The Department for Business, Energy & Industrial Strategy has published guidance on the new requirements. In summary, hours worked can be recorded on the payslip as an aggregate number for the period, or by each category of work for which the variable pay applies. Hours of absence do not need to be recorded. Clients should amend their payroll submissions to include the number of hours of overtime if previously only an amount has been provided, so that Pay Check can make sure your payslips provide sufficient detail to meet the requirements and consider any changes that might need to be made in readiness for the new regime. If an employer fails to comply with the new rules, the worker can make a complaint to an Employment Tribunal with the consequence that, if agreed, the outcome can be published on the Tribunal’s website. If you have staff members who work variable basic paid hours, you must inform Pay Check of these hours so we can report them on the employee's payslip. This is due to the Employment Rights Act 1996 (Itemised Pay Statement) (Amendment) (No.2) Order 2018. This order amends section 8 of the 1996 Act to add to the particulars required within an itemised pay statement to also contain information regarding the number of hours worked by the employee for which they are being paid, but only in situations where the employee’s pay varies as a consequence of the time worked.